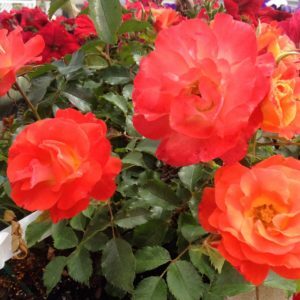 Opening Day 2016 is Almost Here | Prairie View Farm Market, Inc. This winter has almost been something dreams are made of. We live in Illinois. We expect below freezing temperatures and snow. But this year, we were blessed with one of the nicest winters I can remember in a while. One of our customers, Lorriann Krueger even sent me this picture of her pansies still blooming on February 23rd. A little beaten up from winter’s reminders that it still isn’t spring quite yet but blooming strong in defiance of that fact…in Illinois and in February. What a beautiful sight! Here at Prairie View, we are busy planting, planning, cleaning, unpacking, pricing and more. Spring will officially begin here at Prairie View on April 15th. We decided to open about a week earlier because like everyone else we are excited to get out and get planting. However, if you want to begin planting this early, I would recommend starting with preparing your garden beds. Clean up any remnants of fall like leaves and dead plants. Work in a layer of mushroom compost to replace the nutrients washed away by last fall’s rains. Bet you almost forget about those. Replace any shrubs or perennials you know for sure you lost last year. Add a fresh layer of mulch around your perennials, shrubs, and trees. Plant cold tolerant vegetable crops like broccoli, cabbage, onions, etc. Prune your roses around the time you see the forsythia (bright yellow flowered shrubs) blooming. Plant cold tolerant flowers like pansies and violas to add some pops of color. Still itching to do more? No problem, but I would stick to planting containers that can easily be moved outside on warm days and tucked safely inside on cold nights. In Illinois, Mother Nature can be fickle. Spring can bring 70 degrees and sun one day and the next day we will get a sneaky spring freeze that will undo all your hard work if you get too antsy and start putting annuals in your flower beds. Well, I better get back to planting so we are ready when you are! See you soon!